When Britain declared war on Germany in 1914, the rest of her empire went to war too. Many soldiers serving with the Canadian Expeditionary Force came from the country’s most populous province, Ontario. Casualties were on an unprecedented scale and there was not enough capacity in existing hospitals. The Ontario provincial government decided to build a hospital at Orpington, which was then a peaceful village with the large Boundary estate for sale, railway line and with the “best water” making it an ideal location. 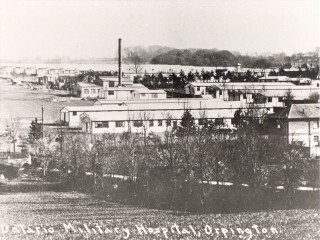 The Ontario Military Hospital, Orpington opened in 19th February 1916, with over 1000 beds. Built on the site of the present Orpington hospital; it was one of the largest and most up to date in the world. In 1917 the hospital was renamed as the No. 16 Canadian General Hospital and another 1000 beds were added. Up to May 1919, over 30,000 men had been admitted, with only 201 deaths. Soldiers had horrendous gunshot wounds and 4320 operations were performed. Facial injuries required the new speciality of plastic surgery. The staff and equipment came from Canada, but men from all over the Empire were treated. All Canadian nurses were fully trained and assisted by male orderlies. Nurses with psychiatric training looked after men suffering from shell shock and other medical conditions such as trench fever, nephritis and pneumonia were also treated. 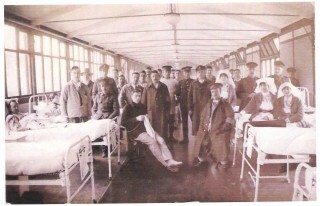 The Hospital was staffed by Canadian nurses and medical personnel from the Canadian Army Medical Corps. One of the surgeons, Thomas McCrae, brother of Major John McCrae who wrote the poem In Flanders Fields, was a pioneering plastic surgeon. The Canadians left in Orpington in 1919. The huts were gradually demolished for housing. 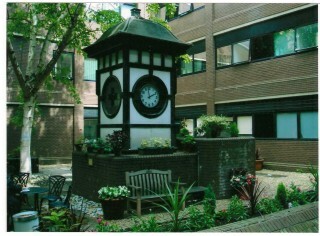 A surviving reminder of the Canadian Hospital is the clock tower, which was restored by the League of Friends. Interesting, my grandfather John MacMillan suffered facil injuries in WW1 and was treated here. Howver we now know he married a local girl Katherine Webb in 1917, thenwas shipped back to Canada later that yeat to be demobbed. We are wondering how they met as her address is given as Victoria hotel. Did patients get visitors from the local area? My Great Uncle Ernest Finan Canadian Expeditionary Force was sent to Orpington after being WIA at Passcendaele (3rd Ypres) in 1917. Thanks for this – very interesting and useful. I became interested after reading about her in Bromley Central Library Local Studies Department.